Described by clients as a “brilliant strategist” in Chambers USA: America’s Leading Lawyers for Business, Graeme W. Bush advises senior executives and professionals and litigates on their behalf in complex disputes. 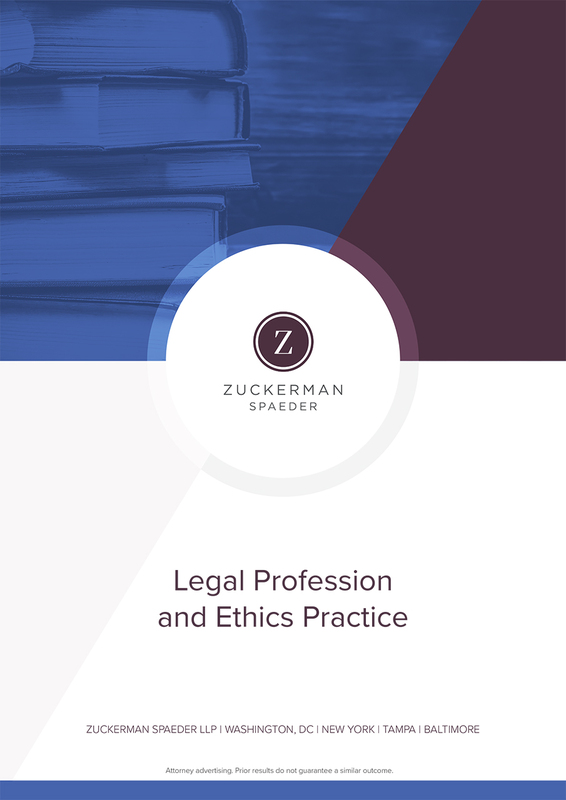 With more than 30 years’ experience as a litigator and 15 years as Zuckerman Spaeder’s chairman, Graeme brings a rich perspective in important business and professional disputes through litigation, settlement, and trial. Graeme maintains a broad litigation practice that focuses on complex commercial and regulatory matters. From advising law firms and lawyers in major civil and investigatory litigation and disciplinary actions to representing companies and executives in securities fraud and SEC enforcement actions, Graeme is consistently ranked among the top litigators in Washington, DC, for commercial litigation. Graeme represents companies, law firms and professional services firms, charities, and creditors’ committees. He also represents individual clients, including senior executives, lawyers and professional services providers, and brokers and portfolio managers. In addition to his litigation and investigations work, Graeme advises lawyers and business professionals on structuring business arrangements that satisfy ethical requirements for lawyers and non-lawyers to work together in a common enterprise. Obtained a favorable settlement of claims of a federal regulatory agency in the bankruptcy of a major originator of mortgage backed securities. Serve as special litigation trustee for a series of residential mortgage backed securities in suits against trustees of securitization trusts. Obtained a jury verdict in favor of client Matthew Lawlor, the founder and former CEO of Online Resources Corporation, that he was entitled to millions of dollars in change in control benefits in connection with his termination by the company. Served as special litigation counsel to the Tribune Company’s creditors committee to evaluate and prosecute fraudulent conveyance and other claims to set aside and subordinate more than $10 billion in loans that financed Sam Zell’s takeover of the Tribune Company. Defended and settled an SEC enforcement action against Michael Sassano, a former CIBC broker in charge of mutual fund trading, whom the SEC charged with fraudulent frequent trading in numerous mutual fund families on behalf of CIBC clients. Obtained a jury verdict in favor of a former partner and senior executive of a private equity company for breach of contract arising from the failure of the company to provide our client a significant ownership interest in the company. Defended a nationally known law firm and their prominent partners in a legal malpractice action arising out of tax advice given in connection with a complicated tax-advantaged transaction and the ensuing tax litigation. Represented a private equity fund established to invest in Israeli businesses in connection with an investigation by the New York AG into illegal “pay to play” payments made by its former managing member. We negotiated a settlement of the civil claims by the NYAG against the fund. Represented a former portfolio manager in an SEC investigation and enforcement proceeding arising out of the omnibus investigation by the New York AG and SEC of market timing in the mutual fund industry. The SEC filed anti-fraud charges against our client, and the case was tried for nine days before an administrative law judge (ALJ). The judge adopted, in large part, our arguments and declined to impose any bar order or civil money penalties against our client. Defended and negotiated a favorable settlement for the chief investment officer of an offshore hedge fund in an SEC enforcement action alleging fraud violations related to market timing and late trading. Represented the former CFO of a European telecommunications company in connection with an internal investigation and with FCPA investigations by the DOJ and SEC. The client faced inquiries from law enforcement authorities in multiple countries regarding illegal foreign payments in a Balkan country, which required the firm to apply its experience in representing clients subject to cross-border investigations. Represented the CEO of a health care services organization in a grand jury investigation concerning Medicare billings for testing services that allegedly did not qualify for reimbursement because doctors were not present during the procedures as required by Medicare regulations. Represented prominent tax lawyers before the IRS in Circular 230 proceedings arising out of a tax opinion. Represented a Swiss corporation sued in a class action under the Alien Tort Claims Act for human rights violations allegedly committed as a result of doing business in South Africa during apartheid. Represented the post-confirmation committee in a bankruptcy suit to recover funds on behalf of creditors from private equity LBO investor on deepening insolvency and other theories. Represented a major national law firm in a federal grand jury investigation and subsequent indictment. The charges were resolved by a deferred prosecution agreement that allowed the firm to continue in business without substantial harm to its innocent partners and employees. Represented an African cellphone magnate in the resolution of disputes with his U.S. and Egyptian partners and a disappointed prospective Israeli investor. The firm handled all aspects of international litigation for the client, including working with counsel in foreign jurisdictions. Represented the founder of a television network in connection with a dispute over the terms of an investment made by NBC. Represented more than 2,500 pension plans in a class action under ERISA to recover fee overcharges, concluding in a settlement of more than $19 million on behalf of the class. Represented a major business law firm in connection with the investigation by the Enron examiner of certain tax transactions in which the firm rendered tax opinions. Represented the long-time executive director of a prominent Washington, DC-area charity in civil and criminal investigations into allegedly improper financial practices. Represented asbestos victims in a $1.5 billion adversary proceeding against a major building materials manufacturer alleging veil-piercing and fraudulent conveyance. The case settled after a two-week trial for $900 million, almost two-thirds of the amount alleged to be due to the asbestos creditors.